Christmas tree in the Anichkov Palace. As Christmas approaches, RBTH recalls how the Romanov imperial family began the tradition of celebrating the holiday in Russia, and what they gave to each other, their servants, and the poor and needy. The tradition of celebrating Christmas at home – with a Christmas tree and gifts – was started at the Russian court in the first half of the 19th century during the reign of Nicholas I by his wife Alexandra Feodorovna, née Princess Charlotte, whom such family holidays reminded of her native Prussia. 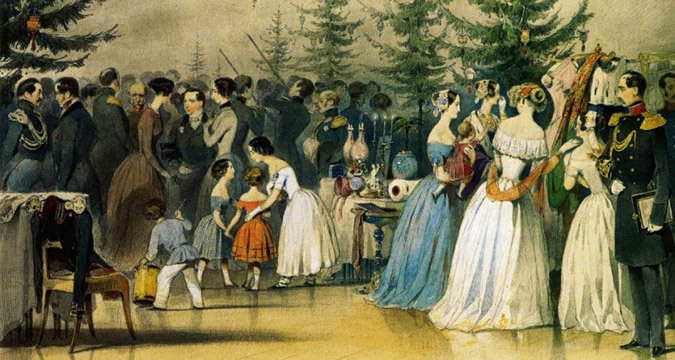 The Christmas party would be held on Christmas Eve on Dec. 24, immediately after the Christmas service, at the Concert Hall or the Rotunda of the Winter Palace. Each member of the family had their own decorated Christmas tree, near which stood a table covered with a white tablecloth, on which gifts lay. “We were always collected in the chamber of Her Majesty,” wrote Baroness Marie Fredericks, a maid of honor of the imperial court. Drawing by Grand Duchess Olga Alexandrovna. Source: Grand Duchess Olga Alexandrovna“There, behind the closed doors, <...> all the children, including the Tsar's, were fighting and pushing each other to first get into the coveted hall. The Empress went ahead to inspect all the tables again, and our hearts were beating with joy, curiosity and expectations. Christmas parties continued to be held after the death of Nicholas I, only the venue for these events changed: Under Alexander II, it was most often the Golden Room of the Winter Palace, while his son, Alexander III, preferred the Gatchina Palace, where the Christmas trees were placed in the Yellow and Crimson drawing rooms, and during the reign of Nicholas II, the family celebrated Christmas in the Alexander Palace in Tsarskoye Selo. Only one thing did not change – the children waiting tensely for a miracle behind the closed doors, as described in the memoirs of Alexandra III's daughter, Grand Duchess Olga Alexandrovna. “We dined in the room next to the banquet hall,” she wrote. “The doors of the hall were closed, Cossack guards stood on duty in front of them. <...> We all <...> were waiting for only one thing – when the useless dessert is carried away, and the parents stand up from the table and go to the banquet hall. Indeed, the hall looked like a magical forest – there were six trees for family members and many more – for relatives and court staff. All of them were decorated with burning candles, gilded and silvered fruit and toys. Gifts for palace Christmas events were supplied by St. Petersburg confectioners. Their “gift sets” would be unlikely to impress today's school students: In 1880, each included two small bags of sweets (“French Surprise” and candies), two tangerines and two apples. Grand Dukes received an additional box of prunes, and Emperor Alexander II – a box of apricots. But of course, the main gifts were those that members of the imperial family gave each other. The royal parents tried to encourage the talents of their children; the youngest in the family of Nicholas I, Grand Duke Mikhail Nikolayevich, once received for Christmas a cello – an instrument on which he wanted to learn to play – and his sister Olga was given a “wonderful Wirth piano” in 1843. Children bought gifts to their parents with their own pocket money, or made something with their own hands. “The gift that I always gave to Papa was the product of my own hands – it was soft red shoes embroidered with white crosses. I was so pleased to see him wearing them!” Grand Duchess Olga Alexandrovna recalled of her presents to Alexander III. The most extravagant gift was probably the Smith & Wesson .38 caliber revolver, with a holster and a hundred of rounds of ammunition, which Alexander III received from Empress Maria Feodorovna. It was, however, an uneasy time – December 1881, less than nine months since the assassination of Alexander II in the heart of St. Petersburg. Perhaps that is why the empress gave good English knives to her sons, Nicholas and George. But the most original gift the family presented to Grand Duchess Alexandra Nikolaevna on Christmas Day in 1843. Upon entering the Concert Hall of the Winter Palace, she found her fiancé, Prince Frederick William of Hesse-Kassel, to whom she had been engaged for six months, tied to a Christmas tree. The prince had arrived in St. Petersburg the day before (the wedding was scheduled for January), but his arrival was kept secret. Nor did the Romanovs forget about their staff; Nicholas I hosted a Christmas lottery for ladies, tutors, nurses, servants and other inhabitants of the palace – each pulled out a card from the deck, and then the Emperor would announce, in turn, the names of the cards, whose owners then received a present from the hands of the Empress – a vase, a lamp or a porcelain set. In 1866, the imperial family held a Christmas event for 100 poor children at the Anichkov Palace for the first time. Each was given a coat, shoes, warm clothes, underwear or a dress, and, after the meal, Tsarevich Alexander (the future Alexander III) ordered the Christmas tree to be knocked down so that the children themselves could choose a toy as a souvenir. From then onward, palace Christmas parties for poor children became an annual event, and the “representational duties” of the imperial family during the holidays only grew. For instance, in 1907, Emperor Nicholas II visited six Christmas events in Tsarskoye Selo alone – at hospitals, a school for nurses and the guards barracks. That is how Alexander Spiridovich, chief of the imperial palace guard, remembered one of these events in his book Last Years of the Imperial Court in Tsarskoye Selo. “In the center of the arena, there was a platform with a giant Christmas tree, up to the ceiling, decorated with thousands of light bulbs," he wrote.